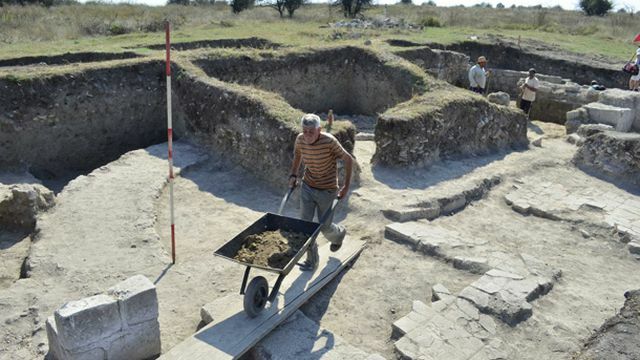 Two cases of theft of ancient artifacts by treasure hunters have been registered during the second excavations of the large Late Roman and Early Byzantine fortress Zaldapa built on top of an Ancient Thracian settlement near the town of Abrit in Northeast Bulgaria. In June 2015, treasure hunters have stolen a limestone base and a small pillar discovered in the ancient city of Zaldapa, reports local newspaper Dobrudzhanska Tribuna, citing Kostadin Kostadinov, Director of the Dobrich Regional Museum of History. The finds had been kept in the yard of the archaeological base located in a hotel near the archaeological site. The second case of theft is even more recent. After the start of the second proper annual excavations of Zaldapa last week, the archaeologists found two limestone bases of columns located in the atrium of the Early Christian bishop’s basilica found in the ancient city in 2014. Since the column bases have been deemed not to be especially valuable for the black market of antiques, the archaeologists decided to temporarily keep them in situ. However, the two limestone bases have been stolen over the weekend. The Dobrich archaeologists believe that the two thefts of archaeological artifacts have been committed by the same group of treasure hunters. The artifacts in question are of some value, and apparently the thieves are knowledgeable about the Antiquity period. The second theft is deemed to be a “demonstration", with the treasure hunters seeking to show the archaeologists that they would not be intimidated by the hired security guards, or would not be stopped by the fact that the archaeological site of Zaldapa is being excavated by the researchers. The report further says that local residents have information about the treasure hunters who committed the thefts but are afraid to reveal it to the police leading the archaeologists to believe that the thieves are part of organized crime groups dealing with illegal trafficking of antiques. What makes the case of the two thefts of archaeological artifacts from Zaldapa even worse is the fact that the second stealing coincided with a visit by French and Canadian archaeologists to the Ancient Thracian, Roman, and Byzantine city who plan to start bringing international students for excavation training.